…I had arrived at an understanding of faith that had far more to do with trust than with certainty. I trusted God to be God even if I could not say who God was for sure. I trusted God to sustain the world although I could not say for sure how that happened. I trusted God to hold me and those I loved, in life and in death, without giving me one shred of conclusive evidence that it was so. I took a deep breath and said the phrase that has come to mean so much. To be an offering and extension of my soul…of my faith. I didn’t have the answers. But I listened to the questions she was asking. I remembered (and told her so) the many questions I have asked over the years. And I reminded her that it is okay…maybe even wise…to hold, but to hold with less grip, to hold tenderly, loosely to the things that are essential in her faith system. The believing that God is real and loving. The part where God knows us better than we know ourselves. The stuff where God is in charge of the universe and all that is in it…and is quite big enough to handle our doubt, fear, hopelessness, and hurt feelings. I then gave her a list of books and the names of authors that would in some cases attempt to answer the questions. But in most cases say “I don’t really know” with more humor and more research and some life experiences to back it up. 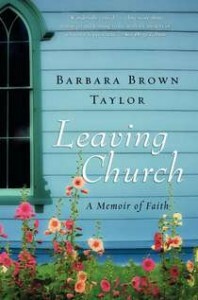 Barbara Brown Taylor is one of those. She writes the theology of the fringe dweller better than so many voices out there. She and Anne Lamott have been salve and bandages which I have laid over the open wound of my heart time and time again in these past several years. So all I can do is offer the first aid kit that I have on my shelf. So many questions. Life is full to the brim with questions if we listen and give them voice. As a person who loves to deconstruct and rebuild things, the answer-less things have been troublesome. Meddlesome. Only to be found to often be life’s trifles.